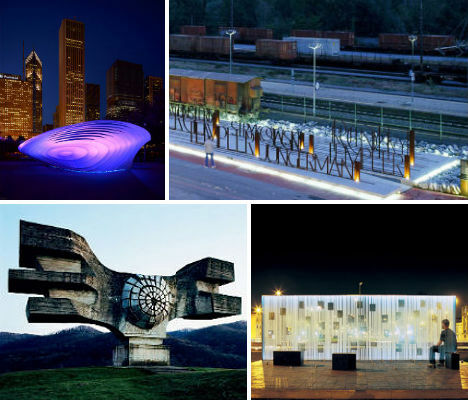 Rich in symbolism and rife with meaning, these 20 abstract modern monuments and memorials radiate emotion and respect. 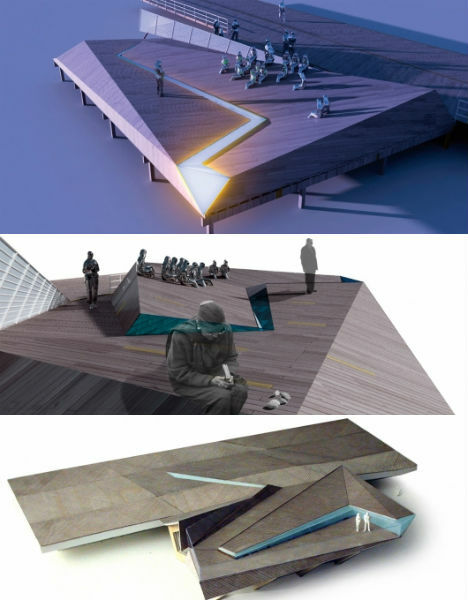 Many architectural monuments like Daniel Libeskind’s addition to the Jewish Museum in Berlin and the new Pentagon Memorial in Virginia honor victims of genocide, terrorism and repression while others pay tribute to the United Nations, religious and historical figures, the military or simply to the transcendent power of peace. Standing in the spot where 355 captured Jews from the Italian Alps were once forced onto freight wagons by the Nazis, the Jewish Deportation Memorial silently acknowledges the tragic history of the site. 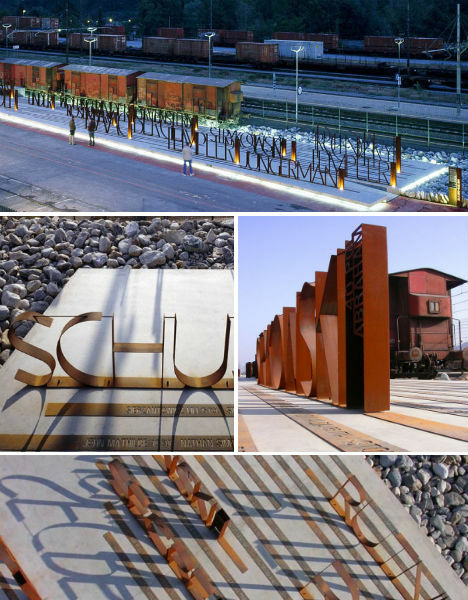 Architects Studio Kuadra placed the names of the only 20 survivors in three-dimensional steel letters atop a raised concrete platform. 335 plaques in the ground name the prisoners that did not return from the concentration camps. 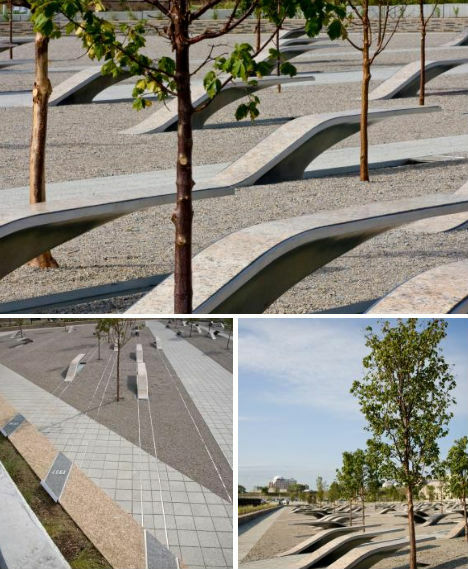 Inaugurated seven years after 9/11, the Pentagon Memorial by KBAS Studio is the result of collaboration with the friends and families of the victims. Located adjacent to the point of impact of American Airlines Flight 77, the memorial is a timeline based on the lives of the victims. 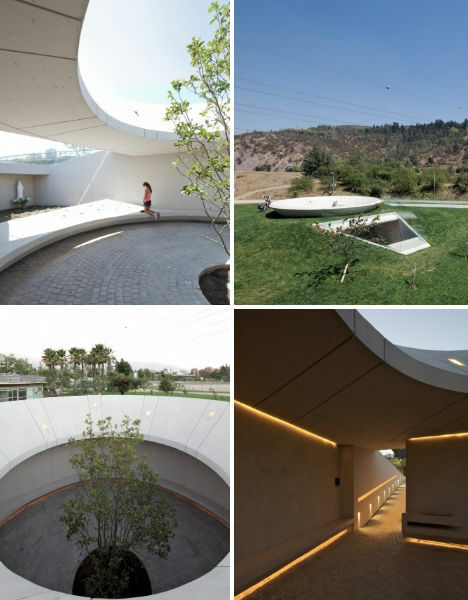 Each ‘unit’ along the lines represents a place dedicated to the individual. 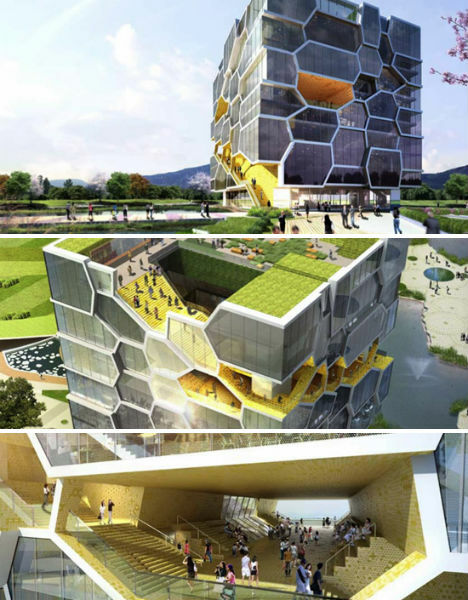 Awarded third prize in a competition to design a United Nations memorial in Chungju, South Korea, this design proposal by London-based architecture firm ACME takes its inspiration from biological cells. The cells each stand for the individual countries that make up the UN, symbolizing the way in which they come together to form a single entity while retaining their own identities. These six eye-catching structures seem as if they’d be hard to forget – but they were built for a nation that no longer exists, and now they stand in ruins. 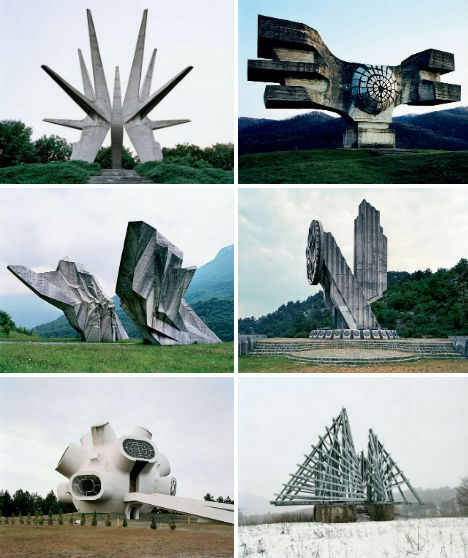 These represent just a small fraction of the abandoned monuments in the former Yugoslavia. Commissioned by Josip Broz Tito, who was president in the 1960s and 70s, the bold, modern designs were designed by an array of sculptors and architects to convey the strength of the Socialist Republic, which fell in 1992. They once attracted millions of visitors every year. Charleston, a city known for its quaint historical architecture, may not be the place you’d expect to find a modern monument. 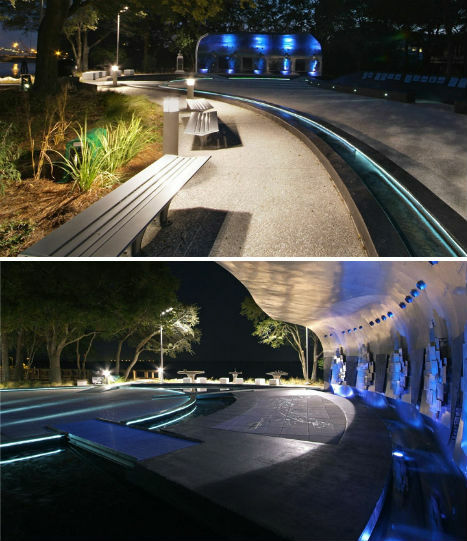 However, the Greater North Charleston Naval Base Memorial manages to blend in, perhaps by virtue of the inspiration architects BNIM and Burt Hill took from the sea. Curving shapes and metal cladding call to mind ships and waves, and printed metal plaques tell the story of the former Naval Base. 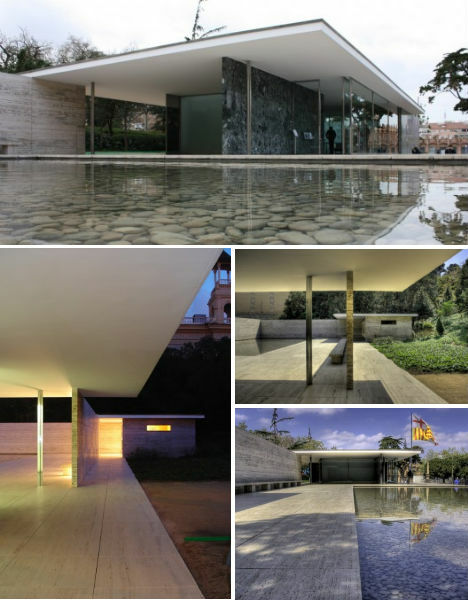 Built for the 1929 International Exposition in Barcelona, Spain, the Barcelona Pavilion by influential architect Mies Van Der Rohe is among the earliest examples of modernism. Designed as an ‘inhabitable sculpture’, a place of tranquility and escape from the exposition, this structure sits at the foot of the National At Museum of Catalonia and Montjuic. It was built on a grid system using travertine pavers. What might otherwise be an imposing structure is softened with geometric cut-outs in the support pillars and colored glass by architects AFGH. 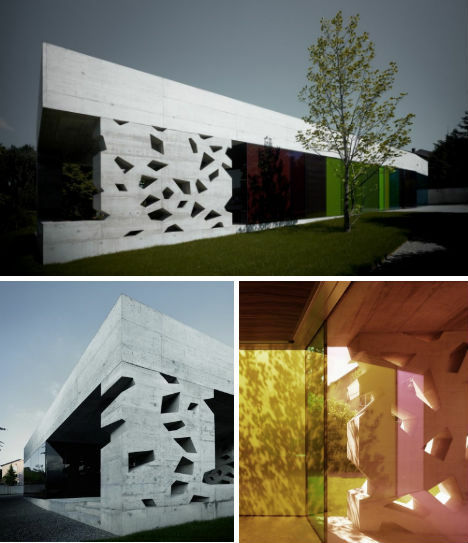 The Erlenbach Cemetery Building in Switzerland houses the visitor area facilities including ceremony services, two vigil rooms and a waiting room. Somber and reflective, the memorial building is also full of light. 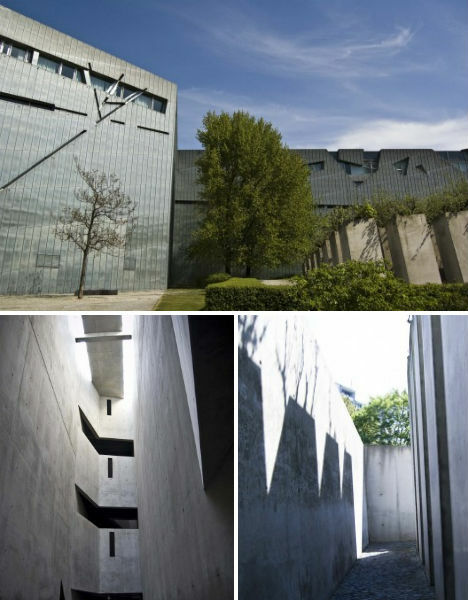 Architect Daniel Libeskind’s addition to the Jewish Museum in Berlin acts as a massive memorial to the millions of Jews who lost their lives in the Holocaust. An interactive experience, the museum, based on an abstracted Star of David, pulls the visitor through various spaces that architecturally manifest concepts of isolation, fear and hope. Libeskind employed towering voids, empty spaces, dead ends and selective daylighting to give the structure an emotional identity. Completed in September 2010, architect Kengo Kuma’s ‘Casalgrade Ceramic Cloud’, or CCCloud, is made from unglazed ceramic tiles adapted for structural use by the client, Casalgrande Padana. Located in a roundabout in front of the company’s headquarters, the 40-foot-tall CCCloud acts like a sheer curtain hanging above a reflective pool. 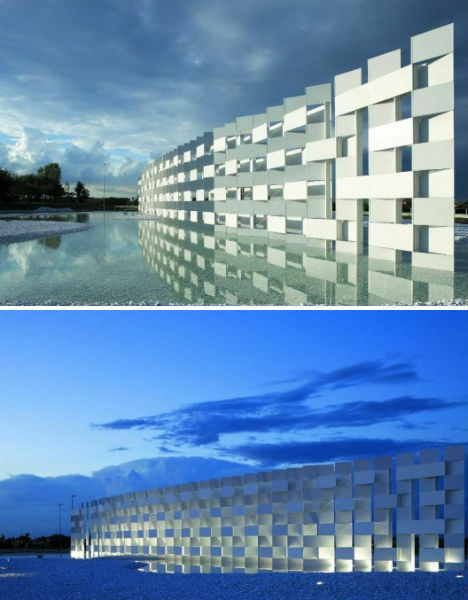 During the day, it blends in with the clouds, while at night, it stands as a dramatic illuminated sculpture against the night sky. 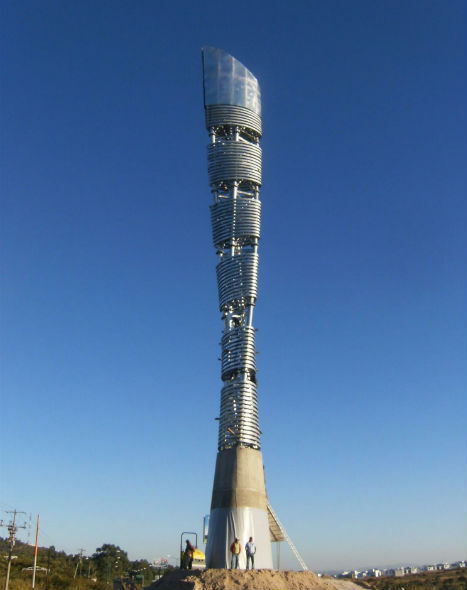 Inspired by a torch featured in a Jose Clemente Orozco mural depicting the social struggle of Mexican independence, the bicentennial torch (Antorcha Bicentenario) stands 45 meters tall at the entrance into Leon, Mexico. 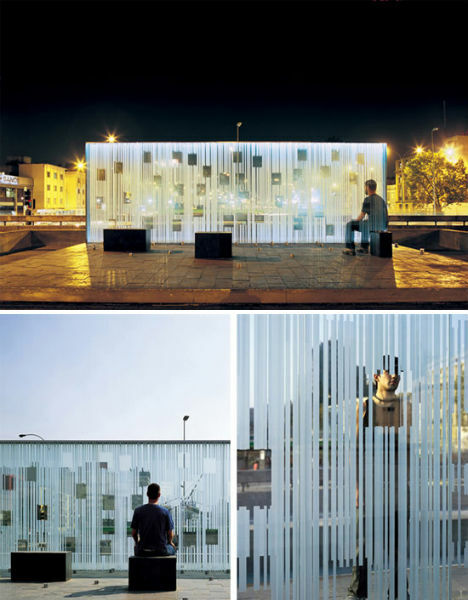 Architects Jose Pareja Gomez and Jesus Hernandez Martinez placed a steel structure made of 100 rings interspersed with 100 voids atop a concrete base; a shadow projected onto them will produce optical negatives. 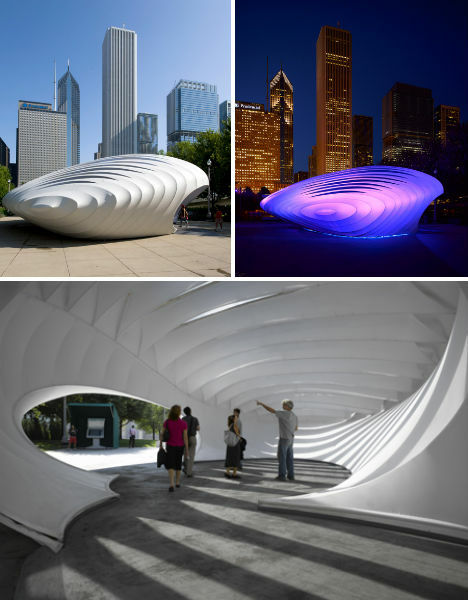 The sculpture will act like a guiding light at night, shining into the air.